Docking can be easy if you Ask Captain Chris. Thanks for registering for our FREE training tips. So you’ve decided to tie up for the night. Maybe you will be docking back at your home port or perhaps your adventure takes you further down the waterway into brand new territory. Once you select your marina you will discover if you should prepare for floating or fixed docks. 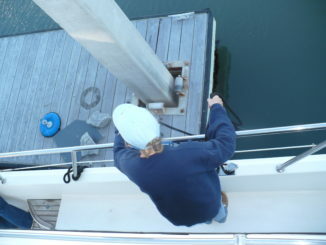 Floating docks require fenders lowered almost to water level to protect your hull as you slide into your slip. We usually place fenders and adjust them after we come to a stop in fixed dock settings as the fenders may snag on the piling while moving into your slip. We have a walking fender ready for immediately placement in the event of an unplanned kiss with another hard surface. 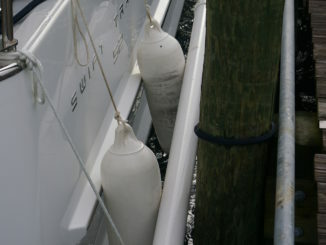 This is an unsecured fender that can safely protect you or your marina neighbor from an unwanted crunch. No matter which side you plan to tie to the pier, we suggest having available lines secured to all port and starboard bow, midship and stern cleats. As you venture out you will come to value these extra steps in preparation. While you may be assigned to slip A-21 with a port side tie, having lines available on your starboard deck will make the reassignment to slip 22 less stressful. When you dock and dock and dock some more, frustration rears its ugly head. Too much practice at one time becomes less enlightenment and more a study of survival. So, practice when the wind and weather are calm and unchallenging. Practice when you have no audience. Practice when you have enough time to dock at least twice then go for a fun boat ride before tying up one last time. 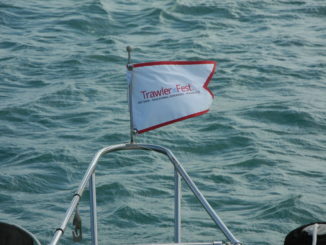 Remember this is pleasure boating. After receiving all five Docking Tips if you’d like more details, consider ordering our 60 minute Docking Training Video….or Ask Captain Chris! The video clip below is a FREE preview of all that you can learn.